Swine influenza is a highly contagious viral disease of the respiratory tract in swine and is distributed globally. H1N1, H3N2 and H1N2 are the most common influenza subtypes in swine, of which avian-like H1N1 is most frequent. All subtypes are continously circulating in Europe. Since 2009 another subtype, pdmH1N1(2009), emerged globally and also in European pig population. Prevelance of the different subtypes varies from country to country (further information on prevalence data can be found here). Surveillance programs are important to improve our knowledge about the dynamics of existing and future subtypes of swine influenza viruses. This will help to understand better the impact on swine production. Why are influenza A virus infections so important? Influenza A virus infections are particularly significant because after infection animals may experience an extended period of reduced vitality, reduced daily weight gain, impaired reproductive performance and reduced disease resistance. Moreover an influenza disease can lead to secondary bacterial and viral infections which are responsible for complications in the course of an influenza infection. This is what causes the economic damage. 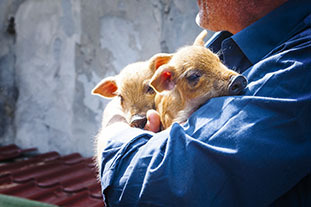 The central idea of One Health approach is that health of humans and animals are closely linked and form a unity (further information on One Health can be found here). According to a definition of the World Health Organization (WHO) "One Health" is an approach to designing and implementing programmes, policies, legislation and research in which multiple sectors communicate and work together to achieve better public health outcomes. A great deal of infectious diseases have zoonotic potential. Viruses such as pdmH1N1(2009) reveal a potential cross-species transmission, either from humans to animals or vice versa from animals to humans. In particular swines are thought to act as “mixing vessels”, meaning that pigs are both susceptible to avian and human influenza viruses carrying both receptors in its lungs. 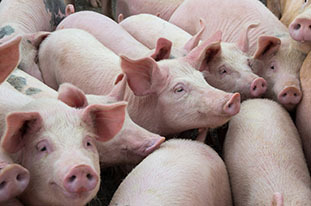 As a result, novel influenza viruses can be generated in pigs. This process is called reassortment which may lead to a new subtype that might be either more virulent, unfit for survival or might even be pandemic. Ultimately, there is a likelihood of transmission of these new reassorted viruses to humans. Vaccination is one part of the One Health Strategy against swine influenza infection to reduce the emergence of new subtypes.